In today’s show Adam Franklin and I chat about the power of kindness and how it can be contagious. When you are kind to someone, they often feel compelled to pay that kindness forward, and thus begins the creation of a kinder, more humane world. Adam Franklin is a social media speaker who gives content marketing keynotes and digital strategy workshops. With humorous and jargon-free presentations, he has delighted audiences around the world. Adam is an entrepreneur, business owner and marketer who lives and breathes social media, content marketing and inbound marketing. Even if you feel triggered by different situations, you have the power to respond differently. Kindness starts with you and how you respond to the world. Treat yourself and others with respect and love and you will start to see the ripple effect. Accept your bad days, don’t beat yourself up for not feeling at your best. Go for a walk, read a book, or phone a friend to help you snap out of it. Be mindful and conscious of what’s going on in other people’s lives. Don’t get caught up in the façade portrayed on social media. It’s not till you ask that you really know what’s going on for others. Be aware of yourself and your surroundings during stressful times. Create rituals and schedule time in your week to show kindness. Be thoughtful of others and recognize the value of connecting people together. Life is bigger than our world, and we can make an impact by being kind and generous. World class people tend to collaborate. They don’t have a scarcity mindset. We have the ability to change how business is done with the power of kindness. Mentions Give and Take by Adam Grant. We can change the way business is done, just through thoughtfulness and kindness. Do one kind thing today, even if you don’t feel like it. What did you do? Share it with us @uncareer on Twitter or at /yourbrilliantuncareer on Facebook. Your Brilliant Un-Career features a bonus private podcast interview with leadership expert and author Alison Vidotto. 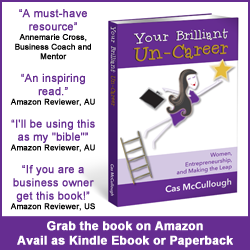 Listen in for tips on how to avoid business faux pas and read Chapter 4 of Your Brilliant Un-Career for more on this topic. Access this interview for free here, along with 32 other bonus business building podcast interviews, templates, worksheets and motivational affirmations. Thanks for having me on your show Cas – great questions, as always!